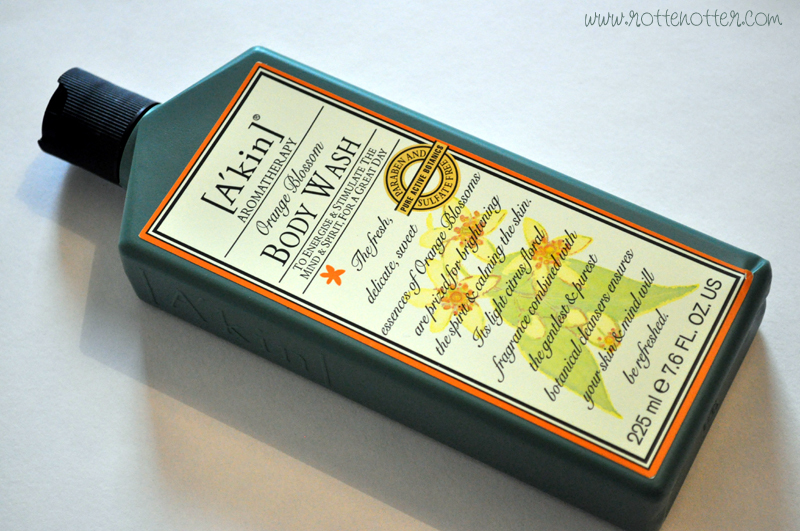 As far as the packaging goes of the [A'kin] shower gel*, I don't like it. It looks a bit old fashioned. I much prefer the packaging of their body scrub. The scent isn't at all what I was expecting. I chose Orange Blossom thinking it would be a nice sweet orangey-floral especially from the description on the front of the bottle. It doesn't smell like that at all, really hard to describe. It's really strong and smells like orange leaves among other things. The scent reminds me of a shampoo that I used to use when my scalp was really bad and dry, a really distinctive horrible scent. My mum really likes it though. I should have gone for Sandalwood instead. Now onto the product, it's a really nice shower gel. As it doesn't have any sulphates in, it won't lather like traditional shower gels. Instead it lathers into a luxurious cream which I much prefer. It feels like it's actually moisturising my skin. I always use my shower gels as bubble bath but this one didn't work so well due to the lack of sulphates. Definitely one to only be used as a shower gel. I think £9.95 is a bit too expensive considering I don't like the scent. If you do find a scent you like, I'd suggest buying the 500ml bottle as it works out cheaper. That's what I'm going to do if I like the sandalwood scent.